Computer running slow ? Don't Worry About That.Here are 10 simple tweaks that can help To Improve or Speed Up Your PC. 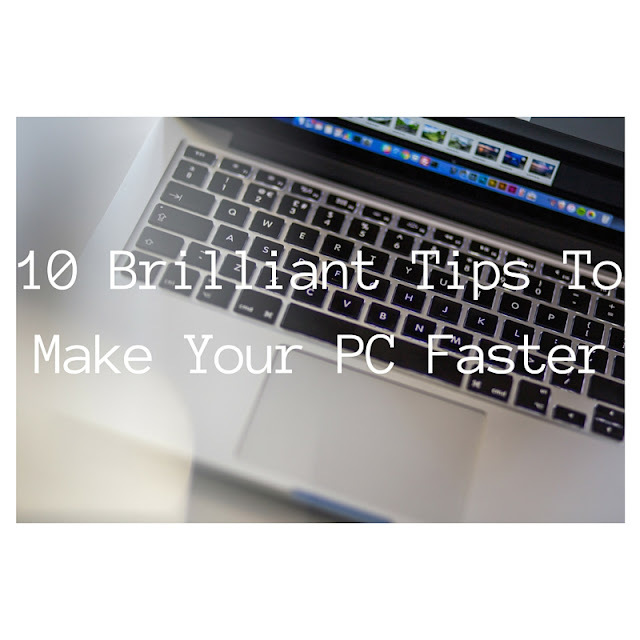 Let your PC boot up completely before opening any Applications. Refresh the desktop after closing any application. This will remove any unused files from the RAM. Do not set very large file size images as your wallpaper. Do not keep a wallpaper at all if your PC is low on RAM. Do not clutter your Desktop with a lot of short cuts. Each short cut on the desktop uses up to 500 bytes of RAM. Empty the recycle bin regularly. The files are not really deleted from your hard drive until you empty the recycle bin. De-fragment your hard drive once every two months. This will free up a lot of space on your hard drive and rearrange the files so that your applications run faster. Always make two partitions in your hard drive. Install all large Software's (like PSP, Photoshop, 3DS Max etc) in the second partition. Windows uses all the available empty space in C drive as virtual memory when your Computer RAM is full. Keep the C Drive as empty as possible. Delete the temporary internet files regularly. When installing new Software's disable the option of having a tray icon. The tray icons use up available RAM, and also slow down the booting of your PC. Also disable the option of starting the application automatically when the PC boots. You can disable these options later on also from the Tools or preferences menu in your application. Protect your PC from dust. Dust causes the CPU cooling fan to jam and slow down thereby gradually heating your CPU and affecting the processing speed. Use compressed air to blow out any dust from the CPU. if you find this article useful please consider sharing it on Facebook, Twitter and Google+.